Cloud computing is undoubtedly the new kid on the block and we are going to get to know him much better in the next short while. A survey done recently in the US indicates that the percentage of small business in the States who use cloud computing is expected to increase from 37% to 78% by 2020, and this trend is reflected in the UK and Europe. But right now cloud computing is still a kid we don’t all know very well and at first he can seem difficult to understand. Put very simply, cloud computing is a technology enabling you to use a network of remote servers, which are hosted on the Internet, to store and process your data, as well as to manage data and applications. A key benefit to this is that you don’t need to invest considerable amounts of money and other resources in all the trappings of IT, such as servers, software and licensing. Your resources are freed up to allow you to concentrate on your core business and expansion. 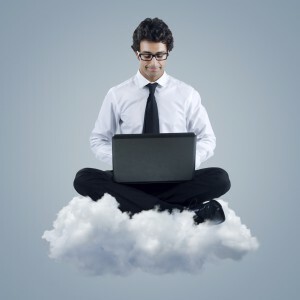 Cloud computing is suitable for both large and small businesses. Without cloud computing, a business needs to provide software and licenses for any number of employees, as well as provide IT support to keep them all up and running smoothly. In a cloud computing system, this is all taken care of by another company, using remote machines to run anything and everything from e-mail to word processing and even complex data analysis programmes. The burden of maintaining servers and apps falls to another source – your cloud computing provider. This will result in major cost-saving implications. Firstly, you only pay for the computing power you use. The cloud pricing format is similar to that of utility pricing, whereby you are charged only for the power, or water, or whatever utility you use. Plus you will no longer have to pay out regularly to update and maintain many IT items. Instead, you will have a predictable operating expense, based on the computing power you actually use. Wherever you are, as long as there is an Internet connection, you will be able to access your data and systems. This opens the door to a much greater mobility and flexibility, including the possibility of home and/or remote working. The cloud is scalable, which is to say that sudden increased demand during heavy periods can be accommodated immediately. Without the need to maintain your IT infrastructure, you will be able to aim your capital and human resources towards the effective running and expansion of your core business. Security is the number one issue. Companies dealing with sensitive or confidential material can fear their data might not be sufficiently protected. This has led to the emergence of public and private clouds. Within a public cloud, you use servers that are shared with other customers; whilst with a private cloud, only you have access to dedicated servers. Which leads us to a third form of cloud. A hybrid cloud system involves running some applications via a public cloud service, whilst keeping others, such as confidential data storage, on servers owned by your business. This is a popular compromise, which seems likely to continue into the future. Meanwhile cloud companies are devoting a great deal of effort to protect the data they handle and many are gaining security approval from regulatory and industry bodies. A further concern is the possibility of loss of service (and valuable data!) if the provider experiences down-time or, worse, if your cloud provider goes out of business. Many people consider the advantages far outweigh the concerns, with the number of cloud company users growing at an exponential rate. There are not many computer users who will not be affected by the new kid on the block in the very near future. In fact, many of us are already interacting with cloud computing – if you have ever used web based email, or have an account with Google, you are already in the cloud. Any business – from one person entrepreneurs to large corporations will do well to get to know the new kid on the block. Do your research, find the right reliable cloud computing provider for your requirements and weigh up the pros and cons. A great many who do this over the next few short years will decide to make the new kid part of their gang. This entry was posted in Observations & Answers on September 17, 2014 by Valerie.